Quick, easy and delicious, these Roasted New Potatoes with Garlic and Rosemary make a fab alternative to traditional roast potatoes. I think I *may* have mentioned before how I am a BIG roast potato form. I love traditional roast potatoes of course, but also roasted sweet potatoes, parmentier potatoes, polenta roast potatoes, Greek-style roast potatoes…basically roast potatoes any which way!! But what I haven’t really shared so far on Easy Peasy Foodie is my Roasted New Potatoes. Which is a massive omission as they are gorgeous – especially with lashings of garlic and rosemary. They are also super quick and easy to make… Just 5 minutes par-boiling and 20 minutes in the oven and they are done! Perfect for when you are in a hurry or fancy having roast potatoes midweek. And because I roast them with the skin on they are a teensy weensy bit healthier than regular roast potatoes too – bonus!! These Roasted New Potatoes would go with anything you would normally serve with roast potatoes. They would be gorgeous with classic roast chicken and a salad, for example, as a summery version of a traditional roast dinner. But these Roasted New Potatoes with Garlic and Rosemary are also fab with dishes where you might normally have chips. They go brilliantly with my Spicy Moroccan Lamb Burgers, or my Nandos Style Chicken Burgers and they would also be wonderful with my Slow Cooker BBQ Chicken Sliders or my Greek Style Lamb Kebabs. Preheat your oven to 220C / 200C / gas mark 7 / 425F. Place the oil in a large roasting tin / oven tray with sides and place in the oven to heat up. Place the chopped potatoes into a large saucepan. Pour over boiling water and par boil on a high heat for 5 minutes. Drain the potatoes in a sieve or colander and then return them to the pan to steam dry for 5 minutes. Put the lid back on and give them a little shake if you would like them to have crispy edges. Carefully remove the hot oven tray from the oven, tip in the potatoes and add a little salt and pepper. Turn the potatoes in the hot oil, spread the potatoes out on the tray in a single layer and return to the oven. Cook for 10 minutes. Meanwhile mix the garlic and rosemary together in a small bowl. After 10 minutes, remove the potatoes from the oven. Add the garlic and herbs mixture and turn the potatoes in the garlic and herbs to ensure they are all coated. Spread out again in a single layer and cook for a further 10-15 minutes or until golden and crispy. Serve as part of a roast dinner, or as a side dish to any meal where you might otherwise serve mashed potatoes or chips! To reheat, place the roasted new potatoes on a baking tray in a single layer and cooked in an oven pre-heated to 200C / 180C fan / gas mark 6 / 400F. Reheat for 15-20 minutes, or until piping hot all the way through. I am sharing this recipe with Brilliant Blog Posts, Cook Blog Share, Cook Once Eat Twice, and Recipe of the Week. These look delicious and would be great for my family as they all prefer roasted potatoes rather than simply boiled new potatoes. Thanks for sharing with #CookOnceEatTwice! These look lovely Eb, I love a roast potato. A great quick recipe, thank you for sharing. 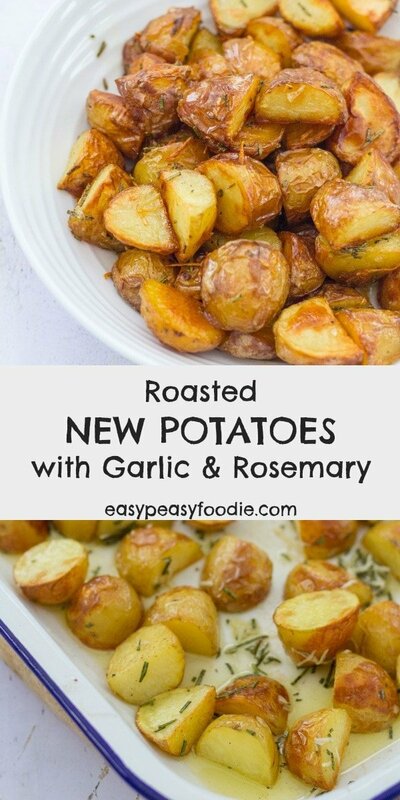 Ooohh, I love the combination of rosemary and garlic with the roast potatoes. This is such a simple, beautiful side dish: I could absolutely see serving it along side a gorgeous roast chicken for Sunday Dinner! Now here’s a recipe that my kids would go for! Love roasted potatoes and I’ll have to make this just as soon as it’s cooler than 30 degrees in my kitchen. Wow they look amazingly crispy! Oh these look really amazing! I wanting to go in to the kitchen and make some for a supper snack!! Oh wow these were amazing!! !